The Ephemeris Tool gives you the ability to place a small visual ephemeris at any selected date on the chart. This is a great way of being able to quickly mark important astronomical information on your chart, without having to switch to the main ephemeris view all the time. The Ephemeris tool allows you to customise the settings to your preferred settings, with all the options available on the main ephemeris form (such as selecting the planets and the aspects you want displayed). This tool is available with the Astro module. Take the value to the right of the decimal point and x 360 (0.102777 x 360 = 37). Using the above example of $3.97, the Price label will display at 37 degrees. 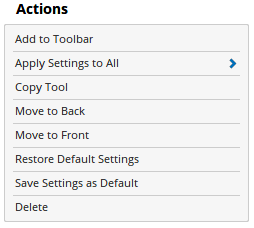 Add to Toolbar: Click this action to add the selected Ephemeris Tool to your custom toolbar. Current Chart: If you have more than one occurrence of the tool applied to your chart, selecting this option will apply the properties of the current selection to the other tools. Current Page: If you have more than one chart on the current page and the Ephemeris Tool is applied on each then this option will transfer the current selected property settings to each tool. Current Workbook: For each chart that has the Ephemeris Tool applied this option will transfer the selected tool’s property settings to each tool on every chart in your workbook. Copy Tool: Allows you to copy the selected Ephemeris Tool, which can then be pasted onto a different chart window. Move to Back: This option allows the selected item to be positioned behind the chart. Move to Front: This option allows the selected item to be positioned in front of the chart. Restore Default Settings: Click this action if you have adjusted the default settings of the Ephemeris Tool, and wish to return to the standard properties originally installed with Optuma. Save Settings as Default: If you have adjusted any of the Ephemeris Tool Properties (colour, for example) you can save the adjustments as your new default setting. Each time you apply a new Ephemeris Tool to a chart, the tool will display using the new settings. Delete: Delete the Ephemeris tool from the chart. Date: Selecting this option will display the time control panel where you can nominate the desired time, date and year for the Ephemeris tool. Planets: This displays the list of available planets that you can select from to be displayed on the Ephemeris tool. Longitude Orb: Allows you to adjust the tolerance for what constitutes a planetary relationship. For example, if the sextile (60 degrees) aspect is used and the orb is set to 2 then Optuma will consider any planetary relationship between 58 degrees and 62 degrees as having met a sextile relationship. Latitude Orb: Allows you to adjust the tolerance for the declination (only applicable for the Parallel and Contra-Parallel aspects) For example, if the declination orb is set to 2 then Optuma will consider planets to be parallel if their declinations are within 2 degrees of each other. Use Chart’s Price Unit: By default the price unit of the chart is used in the tool calculation. Untick the box to manually adjust the value in the Price Unit property. This is applicable when “Price” has been selected as a “Fixed Point” under the “Planets” setting. 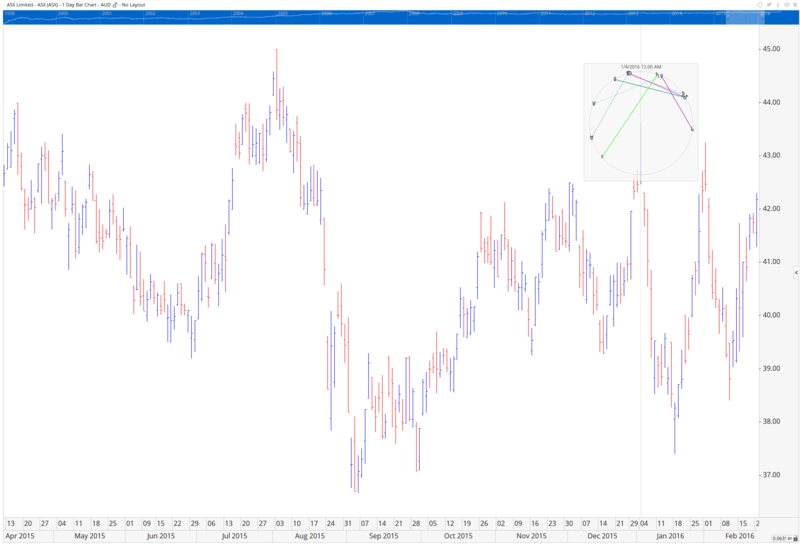 Price Unit: This option is available when the Use Chart’s Price Unit box is unticked (see above). The value in this field determines what one unit of price is equal to in the tool’s calculation. This may require adjustment depending on the data file and timeframe that the tool is applied to. To change the value, simply click in the field and enter a new value. This is applicable when “Price” has been selected as a “Fixed Point” under the “Planets” setting. Alignment: Can elect to display the Ephemeris Tool in different positions in relation to the anchor point, there are 8 options available: Top Left, Top Right, Centre Top, Bottom Left, Bottom Right, Centre Bottom, Centre Left and Centre Right. Show Background: When selected a square background is displayed behind the Ephemeris Tool. Show Date: When selected the date and time of the Ephemeris position will be displayed. Show Date Line: When selected a vertical line will be displayed on the chart at the date position of the Ephemeris Tool. Show Planets: When selected the planetary symbols will be displayed. 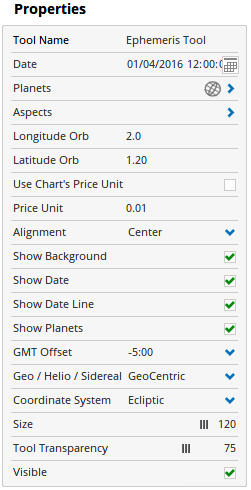 GMT Offset: Use this option to adjust the ephemeris time zone setting for a specific market. Select the required GMT setting and the ephemeris will automatically update. Geo/Helio/Sidereal: Allows you to choose the ephemeris view between GeoCentric, HelioCentric, Sidereal and TopoCentric. Coordinate System: Changes the planetary positions based on equatorial or ecliptic coordinates. Size: Adjusts the size of the Ephemeris Tool. Moving the slider bar to the right will increase the size.